I was first introduced to science fiction literature as a young man in undergraduate school. The first science fiction novel that I read was Stranger in a Strange Land by Robert Heinlein. This book was not typical of the genre in many respects—some called it the Bible of the 60’s counter-culture movement—but I loved it and eventually came to love science fiction in most of its sub-genres. Heinlein became one of my early favorites among science fiction authors. It is the memory of his novel Time Enough for Love that links my love of the genre to the topic of this blog article. The protagonist of the novel, Lazarus Long, who possesses genetics for longevity, was born on Earth in the 20th century and then lived for hundreds of years on many planets as a space traveler. The gift of a long life gave him time enough for love. The moral of the tale is simple: some things take time. Unlike Lazarus Long, none of us have been granted lives that will span many centuries, so what we learn to value in life must come, not through an extension of time, but through a better use of the time that we’re allotted. Much of what fulfills me, both personally and professionally, exists in the realm of ideas. Thinking and what it produces are important to me, and as such, it deserves time. Some of my best thinking takes place while I’m driving long distances or taking long walks. Why these occasions in particular? Because they provide extended periods of time of activities that demand little attention, so my mind can concentrate on thinking. As I drive or walk, after a few minutes my mind has time enough for thinking. Insights in the form of connections, useful metaphors, changes in the ways ideas are organized, or simpler explanations of complex concepts rise to the surface of my consciousness long enough to be noticed and examined. I sometimes record these thoughts on my phone’s digital recorder app or I pull off to the side of the road and write them down. There are many different ways to clear the stage of our busy lives for thoughts to emerge from the wings of consciousness and dance for us. Contemplation can be enabled in various ways, but the time and attention that it requires doesn’t occur naturally in our modern lives. In a time of perpetual connection to computer-mediated data, we must create an oasis of opportunity for thinking by occasionally disconnecting. This takes conscious effort. The futurist, Alex Soojung-Kim Pang, refers to this practice as contemplative computing in his book The Distraction Addiction. The ability to pay attention, to control the content of your consciousness, is critical to a good life. This explains why perpetual distraction is such a big problem. When you’re constantly interrupted by external things—the phone, texts, people with “just one quick question,” clients, children—by self-generated interruptions, or by your own efforts to multitask and juggle several tasks at once, the chronic distractions erode your sense of having control in your life. They don’t just derail your train of though. They make you lose yourself. He not only teaches ways to reduce distractions caused by technologies, but also how to use technologies in ways that enable greater focus on the tasks that they’re meant to support. Much of what he suggests falls into the category of uncommon common sense: ideas that seem obvious and sensible once they’re pointed out, but are seldom noticed until they are. 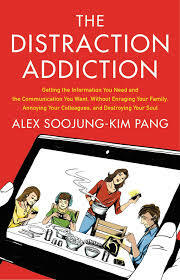 If you’re looking for help in making time enough for thinking—something our world desperately needs and increasingly lacks—I suggest that you read The Distraction Addiction by Alex Soojung-Kim Pang. Thanks for the reference. As you note, there are many different ways to clear the stage of our busy lives for thoughts to emerge from the wings of consciousness and dance for us. For me the best ideas and solutions come to me in the twilight zone between wakefulness and sleep, either during the night or shortly before waking. Research has shown that the brain uses sleep time to organize material that we have learned during the day. That’s probably why, when we just can’t find a solution that we think is possible, we instinctively say, “Let me sleep on it.” Lo and behold, often sleeping on the problem and looking at it the next day, newly organized, is all we need to discover a solution that surprises us with its obviousness. Thank you very much for this post. I’ve identified this issue in my life and I hope that the book can provide me with some practical skills to maintain a disciplined and intentional relationship with technology. I find that most of my best ideas come in the middle of the night – and that if I don’t write them down immediately I may forget them. In this case the tech provides an easy way to get them noted.